The new Kusama's exhibition in Shanghai features nearly 42 works, including some using her symbolic motifs such as polka dots and several?multi-reflective installations. Polka dots are everywhere! 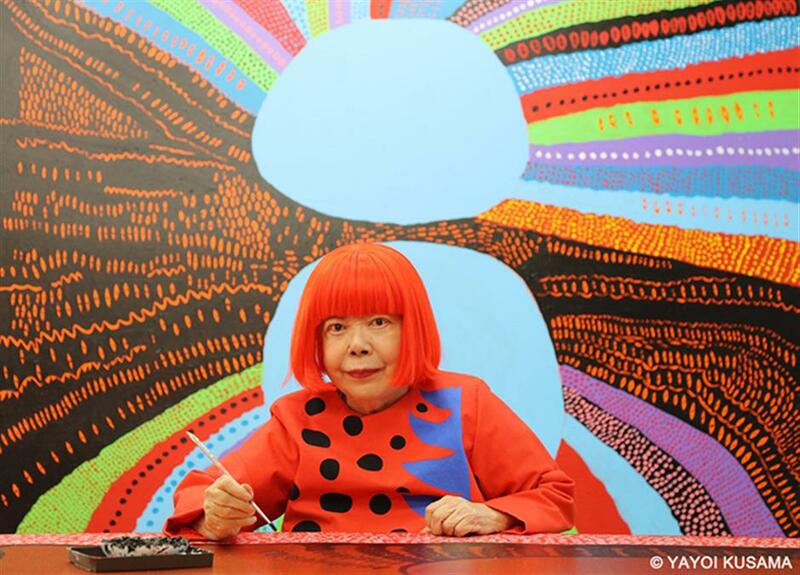 Yes, Yayoi Kusama is back. Since her first solo-exhibition at the Museum of Contemporary Art Shanghai in 2013, her popularity has never waned. Her latest exhibition, organized by the Fosun Foundation, was unveiled last week. 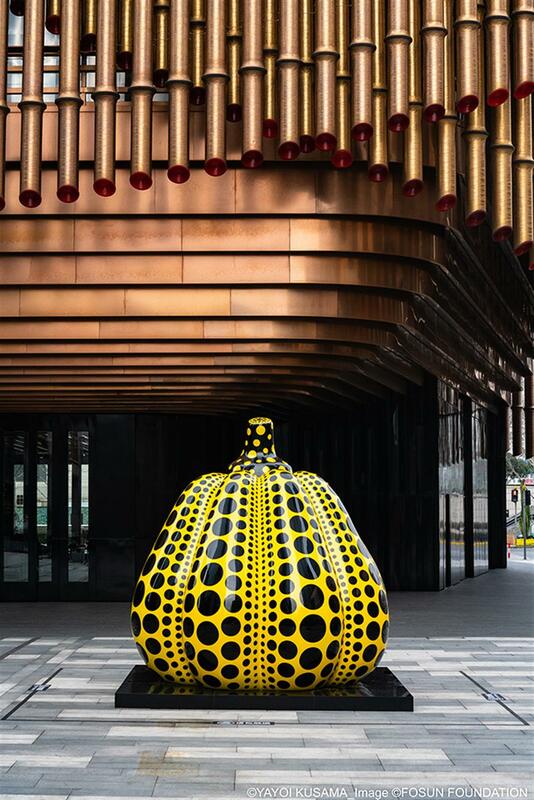 A symbolic work, a 3-meter-tall sculpture in the shape of a black-dotted yellow pumpkin, is placed outdoors at the southern plaza of the Bund Finance Center. Considered one of Japan’s most important living artists, Kusama works primarily in sculptures and installations, but is also active in painting, performance, film, fashion, poetry, fiction and other arts. Her work is based in conceptual art and shows some attributes of feminism, minimalism, surrealism, art brut, pop art and abstract expressionism, infused with autobiographical, psychological and sexual content. The new exhibition features nearly 42 works by Kusama, including some using her symbolic motifs such as pumpkins, mirrored rooms and polka dots, and several large immersive and multi-reflective installations have been created for the exhibition. A path lined with convex mirrors entitled “Invisible Life” is placed in the exhibition hall to guide visitors on a journey of exploration. Each mirror represents a polka dot that continuously reflects the visitors, the buildings, and the surrounding environment. Viewers are immersed in the mirrors’ multiple reflections, and they and the building are constantly flashing in the mirrors, inspiring them to re-examine the relationship between them and the world. The striking visual effect immediately sparked the taking of lots of selfies. Another highlight is a large-scale installation called “The Hope of the Polka Dots Buried in Infinity will Eternally Cover the Universe,” a yellow stem-like pattern and Kusama’s iconic polka dots are intricately twisted to envelope a six-meter high-rise space. She desperately seeks psychological safety as a basic instinct in art. She paints or creates because she has to, because such acts ease her agony. Her studio, where she has continued to produce work since the mid-1970s, is a short distance from a hospital. It is a pity that so little documentation about Kusama’s inner-life can be found at the exhibition, which shies away a more in-depth insight into the artist and her artistic path. Many visitors recalled Kusama’s first exhibition at MoCA. “A Dream I Dreamed” cost visitors just 50 yuan in 2013. Kim Sun Hee, the Korean curator for Kusama’s first exhibition in Shanghai, is a long-time friend of the artist. Her team communicated directly with the artist’s studio, selecting representative works and providing abundant supporting documentation. The three-month exhibition at MoCA attracted nearly 330,000 visitors — an average of 3,000 per day. At the beginning, the museum didn’t even think of using a 1-meter line between the work and visitors in an immersive surrounding, and the large crowds flooding into the museum everyday caused great concern over potential dangers. 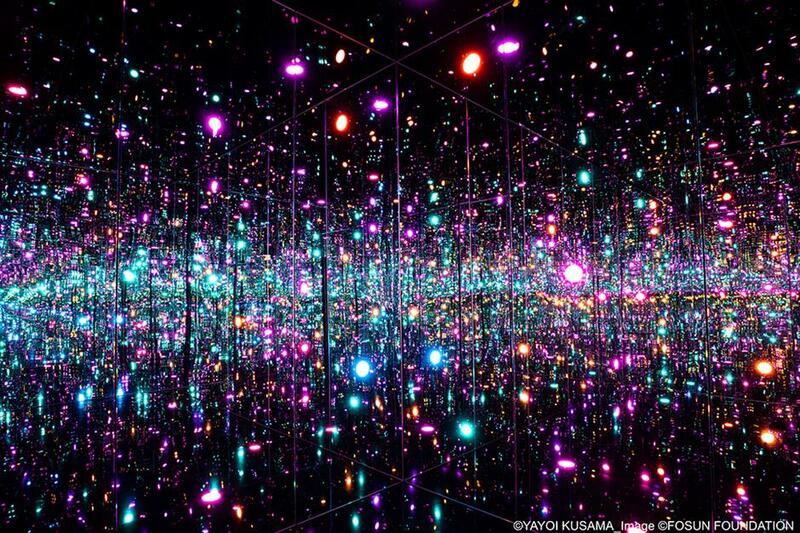 That exhibition ignited a “fever” for Kusama or, to be more exact, immersive installation exhibitions. Such exhibitions often focus on experiences that depend on high-tech, best at attracting a younger generation who grew up with various screens. In another example, news of the opening exhibition by teamLab at TANK Shanghai this month thrilled young people. However due to the lack of a professional and mature curating team at some of the private art museums, documentation about the artist and the work is far from satisfactory. Apart from rising admission fees, the quality of exhibitions is also a big issue. “This is the new art trend, but I don’t believe this is all about art,” said Wang Yuhong, a local oil painter, “In my eyes, sometimes it is too shallow to go to an exhibit for merely a picture without sufficient input of the artist and the work itself.